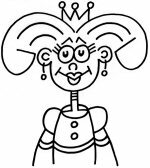 My Cartoonagrams are cartoon characters that are easy to learn to draw and easy to remember. Students use letters of the alphabet arranged in a key word or phrase to construct amusing cartoons. This program is ideal for students who don't think that they can draw: they will discover that they can. It is also very stimulating for artistically inclined students since they can learn a new method for applying their skills and imagination. I developed my Cartoonagrams while working with hospitalized children. I needed a way to teach cartoons that would be fun, easy to learn, and immediately satisfying for patients. Cartoonagrams are what I came up with—and they work. With Cartoonagrams the letters of the alphabet become artistic building blocks: familiar shapes that can be arranged and combined to form dynamic cartoon characters. To date, the age range of my students has been from three years to 100 years (no kidding). Anyone can enjoy the Cartoonagram method of drawing and surprising results are evident within minutes. Creativity and diversity of result are emphasized in this program while perfection, though strived for, is ruled out. My goal is to relax students about final results so they can completely enjoy the learning process. I strongly encourage the "practice makes perfect" theory. Over the past 15 years I have taught this program in many school, hospital, library, and senior center settings. The success of the method has led me to England four times on invitation to teach primary school students Cartoonagrams. Upon request, I can provide references from past clients. I have delivered my Cartoonagram program in a variety of settings to various numbers of students. The range covers one-on-one instruction at the hospital to auditorium presentations of up to 100 people or more. I can adapt the program to virtually any size audience, but my preference is to work with up to 25 students at a time. With a class that size, I can provide some degree of individual attention. Though I have a preference for class size, I understand that for good reasons this preference may not work with the needs of a particular group. That isn't a problem. This program is just as effective with larger groups as it is with smaller ones as long as student courtesy level is acceptable. With larger groups of children, additional adult supervision is required. At this time, I am offering three lengths of program for schools: one-hour (most popular as a five-session after school program), half-day (approximately three hours) and full day. My program is most effective when delivered in one-hour classes. I can impart plenty of material in one hour without wearing out students or pushing their attention span. On any occasion it is far more satisfying for me, and my students, if I spend one hour with three classes as opposed to three hours with one. We can work out what length program will best suit your setting when we are in touch. My personal goal is to allow as many students as possible to enjoy this program with maximum individual attention and encouragement. Materials needed for this program are all commonly found in a school classroom. They are paper and drawing implements such as markers or crayons (crayons being best). I need a blackboard or dry-erase board to teach from and prefer a traditionally oriented classroom space with students facing the presentation board. I do not provide drawing materials. The following rates are based on specific length programs up to one full school day. Depending on the needs or preferences of your group, a more specific rate quote may be needed beyond what is listed here. We can work out details in those cases when we are in touch. Rates may need to beadjusted according to travel distance to program site. Modest travel expenses will be worked out at the time of booking. SPECIAL NOTE ON DISCIPLINE: In consideration of my duties as a presenter, I cannot accept responsibility for student discipline during programs. Common sense guidelines for courtesy and respect are delivered to students with my introduction and I rarely experience discipline problems. Behavior problems will be the responsibility of the contracting group or institution. My goal is to deliver the maximum amount of material—and fun—to attentive students with minimum distraction. FUNDING NOTE: I am an approved roster artist for both VSA Arts of Rhode Island and the Rhode Island State Council on the Arts. I also have an association with The Rachel Branagan Educational Fund, an organization that may provide matching funds for in-school programs. I look forward to hearing from you about scheduling a program. Thank you for your interest and consideration. Please use the Contact Steve link for further info and booking dates.